Hello and Happy Tuesday! At some point Monday, I thought I might not survive work but here I am and I did! lol Hopefully Tuesday will be a much better day! It's time for another Stamp, Ink, Paper Challenge. 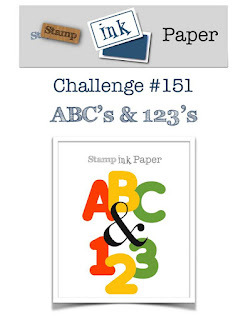 This week's SIP Challenge is ABCs and 123s. I decided to use my new Stampin' Up! Stamp Set for lettering called "Make A Difference". It was one of the new stamp sets from the 2018-2019 SU catalog that I got on preorder and I love it! If you follow my blog you know that I'm all over the place with my love of all things Stamping. The big gorgeous rose (Painted Rose) is from Concord & 9th as is the fabulous background (Everyday Tintables Card Pack). But my big surprise... is this new Stampin' Up! Make a Difference stamp set! It is awesome! So for this card I started out with my background by using Purple Tape to mask off rows on one of my Everyday Tintables Card Pack so that I could ink blend with Distress Ink every other double row. I used Mustard Seed Distress Ink for the Ink blending. Once I was happy with my stripes I cut the panel 4 1/4 x 5 1/2". I had a beautiful sheer green scrap of ribbon that I tied around the panel prior to adhering to an Old Olive side folding A2 card base. The outline of the painted rose was stamped with Versamark onto Watercolor Paper and heat embossed in white. I watercolored with Distress Inks my focal Image. Mustard Seed and Scattered Straw Distress Inks were used on the rose and Peeled Paint for the leaves. Once it was completely dry I also sponged a little of the same inks onto the rose and leaves to add more depth. The coordinating die was used to cut it out and it was adhered with Dimensionals. I snuck a partial piece of a SU White Pearlized Doily under the rose. You can never go wrong with a hint of a Doily... right?? 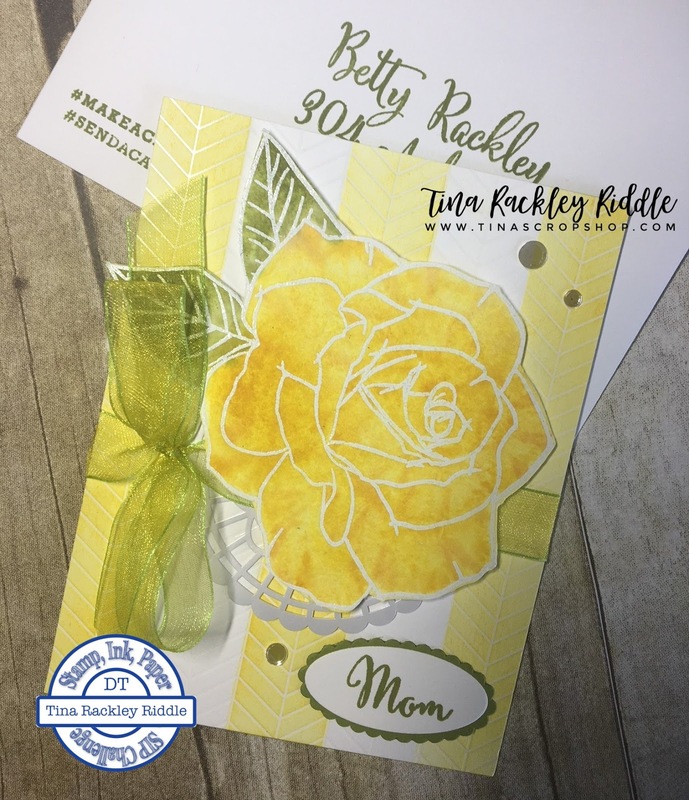 The Mom was created with the lettering from the Make A Difference Stamp Set in Old Olive on Whisper White Cardstock. I cut it out with a Layering Oval Framelit and matted it with a Scalloped Old Olive Die Cut of the same set. I finished this one off with 3 of the Sparking Clear Confetti from Pretty Pink Posh. So back to that Make a Difference Stamp Set, not only does it have some gorgeous lettering and numbering choices but it also has some fabulous back of the card stamps for Handmade by, #Makeacard, #Sendacard, etc. It is definitely worth checking out if you haven't already. How cool is it to be able to stamp your address on the card, stamp any sentiment you want to put together, etc. Sooooo much fun! I'm a believer in this one!